They’re not sweet or juicy like other fruits. Where the hell are their seeds? just how do they get juice out of those things? But I never turn down a good banana. if you dont know where their seeds are…then i am pretty sure you are eating it without knowing! I dont think so. I think they’re seedless. I think the seeds are in the middle of the fruit, but the ones we usually get are seedless. Bananas by far are my favorite fruit. I think you’re right. Favorite? I gotta go with watermelon. Seedless, of course. I’m not a big fan of watermelon. When you visit people overseas, they go nuts with all the watermelon serving. Haha, know what you mean. Heres my top 5: Watermelon, Grapefruit, Pomegranate, Orange and Grapes. I have had heated discussions with a friend of mine in chemical engineering about juicing bananas. It has lead to many a wad of banana mush wrapped in napkins when we eat at the cafeteria together. We have come to the concluding that it is a new law of the universe that bananas can NOT, under any circumstance, produce juice. I plan on having one tonight. Add strawberries and whipped cream! I just eat whipped cream with a spoon. Green Bananas are the only bananas I will eat. I love green bananas too. Brown bananas go straight into the blender – smoothies. Originally bananas were inedible and were completely full of seeds, humans bred together two of the inedible banana species, cultivated them and changed them into the bananas we eat now. Technically they still have “seeds” but they are underdeveloped and they are those tiny specks in the centre of the banana. 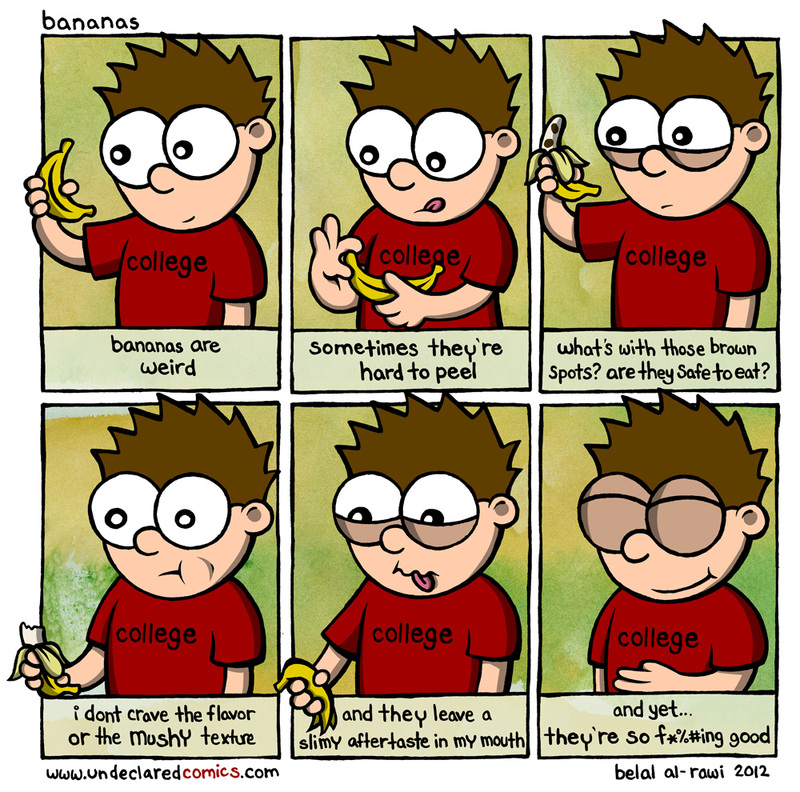 PS: I used to love bananas, until 3 years ago when I suddenly because allergic to them for no apparent reason!